Follow Austin Hull as he produces and writes a pop r&b song, in the realm of Ariana Grande's smash hits "God is a Woman", "Thank U, Next", and "7 Rings", from start to finish. Let us know if you guys like this style of video! Click here to receive all the samples/presets used in today's video for FREE! http://www.makepopmusic.com/landingpage Visit our NEW website! We have sample and preset packs, blog posts, courses, and more! 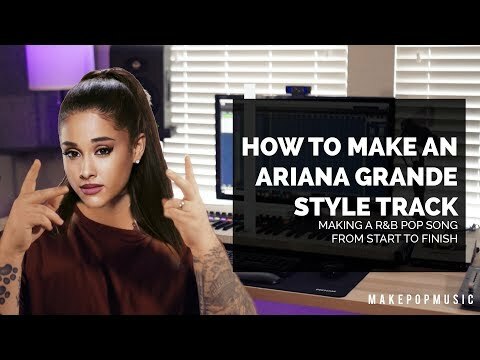 https://www.makepopmusic.com/ DAW I Use: https://new.steinberg.net/cubase/new-in-10/ MIDI Keyboard I Use: https://bit.ly/2SKNW4W ——— Subscribe to our YouTube channel for more content on all things pop music! Join Our Private Community - https://goo.gl/rIqQaP Follow us on Instagram: instagram.com/makepopmusic Follow Austin: www.austinhull.com www.facebook.com/austinhullmusic https://www.instagram.com/austinhull23/ Make Pop Music is the #1 resource for independent pop producers, writers, and artists. Thank you for being a subscriber! ——— Have a suggestion, question, or need help? Leave a comment below!